Empowered patients take responsibility for their own health: they bring the knowledge, skills, attitudes and self-awareness necessary to improve the quality of their lives. As healthcare delivery and reimbursement models are shifting, empowered patients are imperative to profitability managing care. Identify: Identify patients and the messages they need to hear. Connect: Reach patients on their own terms, through their preferred media, in language they understand. Activate: Inspire patients to care. Engage: Give patients the tools and understanding they need. Act: Patients take steps on their own. Maintain: Keep patients on the right path. Measure: Measure outcomes at the individual level and in aggregate. 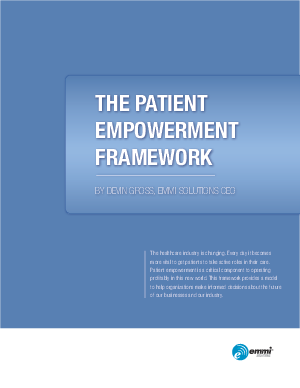 Download this paper to learn more about this effective, affordable and measurable approach to patient empowerment.